Plans change. Especially when you're busily teaching on a reservation and gone for over seven hours a day. I wasn't able to post on Monday as I planned, but I figured it was better late than never! The barn roof is a very good place to cloud gaze. I should know, because after a day of tests, questions, and math problems, that's where I was. The wind blew my hair across my eyes and the sun glared down on my face. Spring, as of last week, had finally come. God gently whispered to my heart, "Joanna, see how I make the clouds follow a course? See how the wind beats and the sun shines? See how the rooster crows and the goats bleat? See My creation and how I take such care of everything? Can you trust Me to provide the next step for you?" I glanced up and noticed some clouds next to each other seemed to spell out the word "If" with a question mark. I took a double take. Maybe it was my imagination, but it certainly provided food for thought. Could I trust the Lord Almighty in His plans for my life? Could I surrender my dreams and lay them at His feet? A heart cloud floated by. I thought of how I had put my recent plans in His hands and told Him to either open or close the door. He closed the door. At first it was a bit hard to take, but then He gave me such a deep peace in my spirit, that I gladly accepted His answer. But now here I am, on top of the barn and wondering if I can surrender all my other plans to Him and let Him bring about everything in His way and timing. A peace beyond comprehension settles deep in my heart and I simply know. I know I can trust Him, because in my fourteen years of following Jesus, He's never let me down yet. 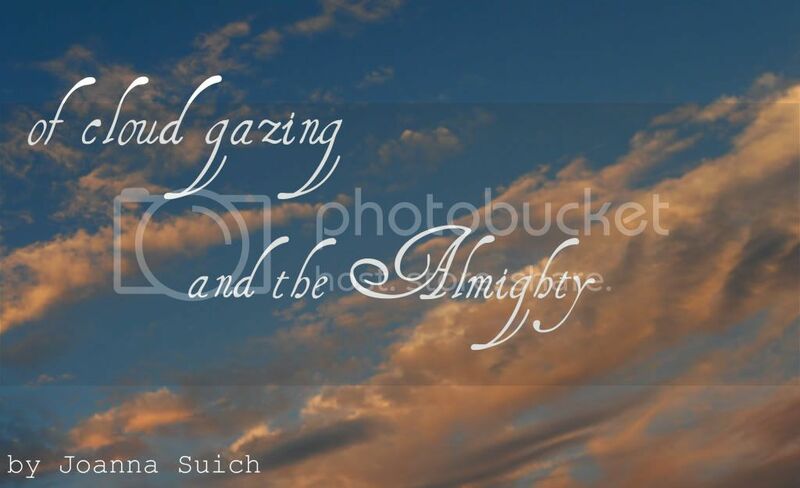 I gaze up at the whispy clouds and give it all to my Jesus. And I just know He's gonna take care of everything.